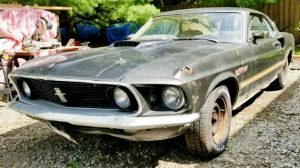 As some of you likely know, I am helping to clear out a large collection of salvage and project vehicles from a private owner. You can read more about the collection here. 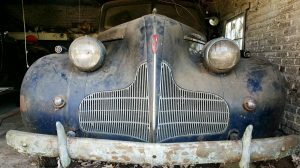 As we move ahead with the process, I’ll be listing some of the more interesting cars individually, which will also help readers see more info about specific vehicles they may be interested in. Here’s the next vehicle we’ll feature, which is a one-year-only 1986 Volkswagen Jetta GLI, unofficially known as a “Pirelli” edition. What Makes it Special? If you follow the second-generation of VW’s U.S. lineup, you likely know these cars are rapidly disappearing from the landscape. Few original cars are left, especially given the popularity of 16V and VR6 swaps. 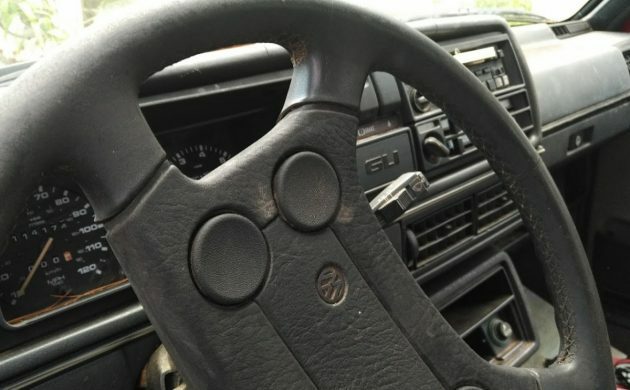 While this 1986 Jetta isn’t the more powerful (and yes, desirable) 16V GLI, it at least remains in stock condition giving the next owner a clearer sense of where to begin. 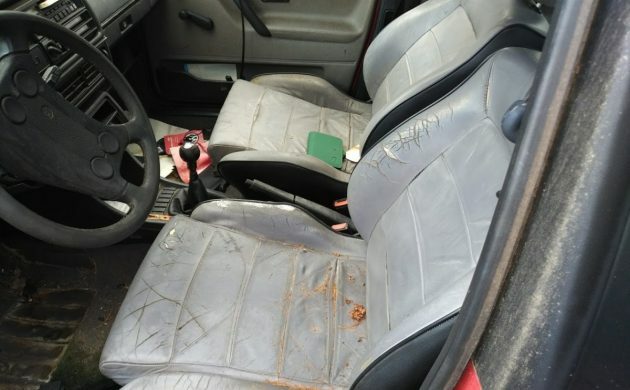 Plus, the Pirelli edition cars are the only MK2 to feature a leather interior from the factory, and the seats in this car remain in very good condition. 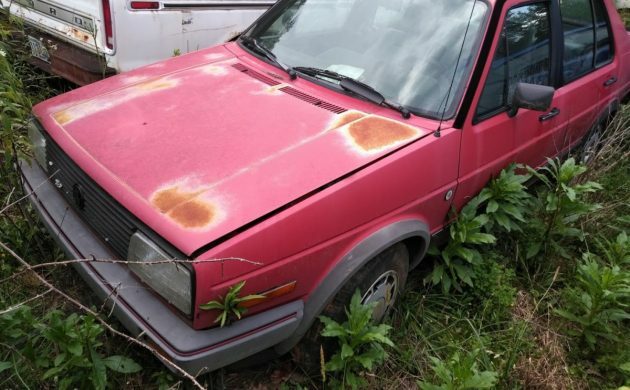 Body Condition: Another bonus that MK2 fans will appreciate is the lack of rust present on this Jetta. It’s been a Georgia car all of its life and is incredibly dry. 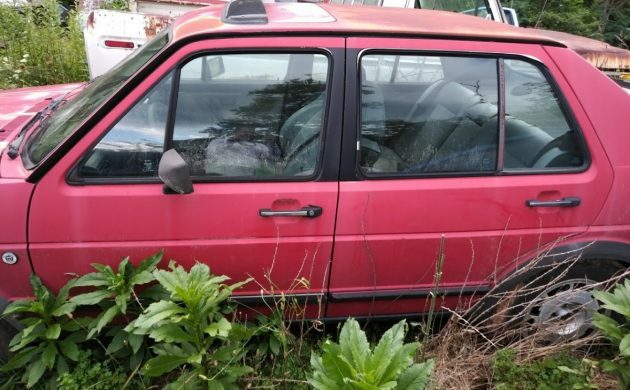 In the interest of full disclosure, I seriously considered picking this car up myself before I found another vehicle on the property I deemed more interesting. The Tornado Red paint exhibits the fading that is typical with cars left out in the sun, and the top surfaces – hood, roof, and trunk – will all need new paint to be perfect. I believe the rest of the body could be buffed back to life. Mechanical Condition: The Jetta was running/driving when it entered the property. According to the seller, the owners left the car with him after it became less pleasant to drive following the replacement of the clutch. He suspects the clutch needs further adjustment in order to engage property. Otherwise, the Jetta did not have any known mechanical faults at the time, but the factory 8V hasn’t been fired up in several years. While a MK2 Jetta isn’t everyone’s idea of a project car, Volkswagen enthusiasts are among the most passionate group I’ve ever been a part of. The car that got me into German vehicles and tasteful modifications was a third-generation Jetta, which explains why this car evoked tons of nostalgia for me when looking it over. The Pirelli edition, no matter how unofficial it may have been, is near extinct in the U.S., and few wheels look as good on this generation of Volkswagen as the factory “P-Slots” as seen on this car. Give me a yell if you’d like more information beyond what’s presented here. Definitely want to spray some WD40 down those spark plug holes before attempting to start it. Yup! A buddy of mine bought a brand new 1989 Golf. He bought it in the middle of winter 1988-89 in Colorado and I remember cruising around in it with that heat cranked. I do remember how warm it was, and how new the car smelled! Looking at this thing now, that seems like a million years ago. I bought my first VW, a Jetta, three years ago as my daily driver..I’m in a Passat now and find to my surprise that I’m hooked on VWs. I’d absolutely consider a project such as this one, with engine and suspension mods it could become a nice little sleeper in its own right. It may have been rust free when it entered, but I wouldn’t bet on it still being that way after sitting for several years on the Georgia red clay. Without underside pics to the contrary, assume the worst. While I appreciate your optimism, the truth is there is no way that paint will ever buff back to any level of acceptability. A full respray is in order. The seats are incorrect for this car. They are actually from a Mk1 Cabriolet. Count on replacing at least the front seat upholstery if a matching interior is important to you. CIS cars are never happy about sitting for long periods of time. 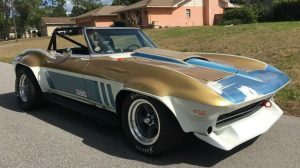 The next owner is going to need a lot of patience and a serious attention to details, particularly with the vacuum system, the fuel delivery system and the grounds. Leather seats in a 1st gen Rabbit convertible Kevin ? Wolfsburg Edition Cabriolets, beginning around 1985 and lasting through the end of the run in 1993. …I can attest there’s no rust in the floor. Thanks for assuming the worst about a car you have never seen nor inspected. Respray is for people who want perfection. I was not saying paint correction would solve all of your problems. I would personally paint the hood, roof and trunk with single stage and try my luck at buffing back the side panels. I really, really, REALLY don’t get people who make a point of posting to point out all of a car’s faults, even those that aren’t true. If you are seriously interested, please contact me to set up a time to view the car. Thanks. Jeff, I have lived in Georgia since 1969. I have also known of this “super secret” location for a few years. I know exactly what the ground is like. 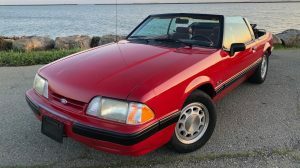 I really, really, REALLY don’t get why people selling cars don’t present a car at its best. If you don’t want people to assume the worst, put in a little effort, pull the car out of its current hole and take some underside shots. Best of luck with the sale. I hope the eventual buyer knows what they are getting into, otherwise this car will just go from abandoned on this property to abandoned on someone else’s property. Any Pirelli calendar girls included? Wrote the seller in this comtact form above and never got a response from them.